What could be the world’s earliest illustrated Christian manuscript has been found in a remote Ethiopian monastery. The Garima Gospels were previously assumed to date from about 1100AD, but radiocarbon dating conducted in Oxford suggests they were made between 330 and 650AD. This discovery looks set to transform our knowledge about the development of illuminated manuscripts. It also throws new light on the spread of Christianity into sub-Saharan Africa. 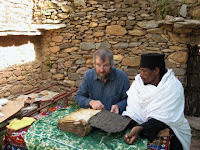 The Garima Gospels are preserved in an isolated monastery in the Tigray region, set among mountains at 7,000 feet. 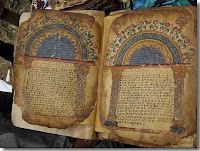 No other Ethiopian manuscripts can be dated from before the 12th century. So the Garima Gospels represent a unique survival of an early Christian text in sub-Saharan Africa—pre-dating all others by more than 500 years. The radiocarbon dating could even link the manuscript to the time of Abba (Father) Garima, who established the monastery. Originally from Constantinople, the monk is traditionally believed to have arrived in Ethiopia in 494. Legend has it that he copied the Gospels in a single day. To assist him in completing this lengthy task, God is said to have delayed the setting of the sun. 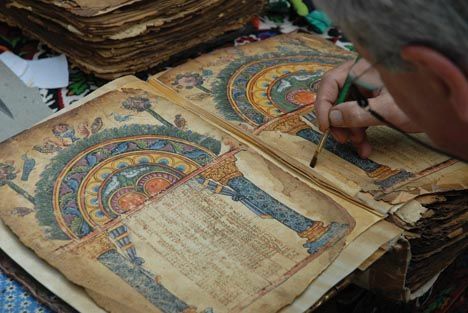 The Garima Gospels were recently conserved by an Anglo-French team, sponsored by the Ethiopian Heritage Fund. None of the conservators had ever faced such challenging conditions, and work had to be done outdoors, with two funeral biers serving as tables. The first report about the existence of the Garima Gospels came in 1950, from British art historian Beatrice Playne. Women are not allowed inside the monastery, but as she was considered an honoured visitor, its treasures were brought outside for her to view. She recorded that “there were several illuminated manuscripts whose ornamental headings struck me as Syrian in style”. In the 1960s the manuscripts were studied by French specialist Jules Leroy. He found there were two separate sets of Gospels, now known as Garima I and Garima II. Both date from the same period, and Leroy concluded that they were created in around 1100. He found it difficult to envisage that they could have reached the country in the early centuries of Christianity. The Garima Gospels have never left the monastery, and because of its remote location and the reluctance of the monks to show them, few scholars have had the opportunity to even briefly see them (although listed in the 1993-96 catalogue of the touring US exhibition “African Zion: the Sacred Art of Ethiopia”, they were never lent). Jacques Mercier, a French specialist in Ethiopian art, has seen them on five brief visits. On one trip he took two, loose small samples of parchment, the size of a modest coin. The manuscript was then in an extremely fragile state, and fragments of brittle parchment broke off almost every time it was opened. Mercier later arranged for the two parchment fragments to be radiocarbon dated at the Oxford University Research Laboratory for Archaeology. A sample of the parchment (probably goat skin) from Garima II was dated to 330-540 and one from another illustrated page to 430-650. Radiocarbon dating can only yield a range of dates (the Garima figures are subject to a 96% probability), not a precise date, but the middle year of these two samples would be 487 or 488. Although it may well be coincidence, Abba Garima is said to have arrived in Ethiopia in 494. So the radiocarbon dating raises the possibility that the 1,500-year-old oral tradition associating the Gospels with the monk may be true—even if he did not complete the work in a single day. However, Mercier believes that on stylistic grounds the Garima Gospels are slightly later, perhaps around 600. Even this later date would make them among the earliest surviving illustrated Christian manuscripts. The oldest dated are the Rabbula Gospels in Syriac, completed in 586 and now housed in the Laurentian Library in Florence. The other renowned expert on the Garima Gospels independently suggests a similar date. US scholar Marilyn Heldman has visited the monastery, but she was not shown the Gospels, probably because of her gender. But, based on photographs, Heldman concluded they are from the sixth century. The texts date from the same period as the illuminations, although these pages have not been radiocarbon dated. They are written in Ge’ez, the ancient Ethiopian language, and they are by far the earliest texts (other than a few stone inscriptions). Garima I, the first of the two volumes of the Gospels (348 pages), opens with 11 illuminated pages, including canon tables (which provide a concordance for the four Gospels). This is then followed by the text of the Gospels in Ge’ez. Garima II is similar (322 pages), with 17 pages of illuminations. It has fine portraits of the four Evangelists. There is also an unusual depiction of the Temple of the Jews, a building with a staircase in a form otherwise unknown in Christian iconography (the architecture is possibly based on a Persian Sassanid garden pavilion for exotic animals, representing paradise). The Ge’ez is by a different scribe from that of Garima I (the texts are slightly different, as is the spelling). The illuminations are all in the early Byzantine style, but the question is where they were painted. Mercier believes that the images of Garima I probably come from Syria or around Jerusalem (stylistically the canon tables are similar to those of the Rabbula Gospels, probably made at a Syrian monastery). Garima II has illuminations that show some affinity with those of Coptic Egypt. It is also possible that the illuminations were done by a Middle Eastern artist working in Ethiopia or an Ethiopian in a Middle Eastern studio. Around 20 different species of birds occur in the illuminations. A preliminary analysis suggests that most are found throughout the Middle East and none are strikingly Ethiopian, but they could have been taken from a model book or another canon table. However, further analysis of the birds might help pinpoint where they were painted. The text itself was probably copied in Ethiopia (rather than by a Ge’ez scribe in the Middle East), since it appears to have been added after the illuminations had been completed. This is particularly clear in Garima I, where the spacing in the canon tables does not fit the Ge’ez. The covers of the Gospels are important. London binding specialist Nicholas Pickwoad, who has visited the monastery, told us that the cover of Garima I could well be contemporaneous with the contents. This would make it the world’s earliest bookbinding still attached to its text. It is a copper-gilt cover over a wooden board, which, although ornately decorated with a cross, is made in a rather crude style. There are holes, which may have originally been plugged with jewels. The silver cover of Garima II dates from the tenth to the 12th centuries. The survival of the Garima Gospels is astonishing, since all other early Ethiopian manuscripts seem to have been destroyed during turbulent times. Very little is known about the history of the Abba Garima Monastery, but it may have been overrun in the 1530s by Muslim invaders. More recently, in 1896, the area was at the centre of resistance to Italian forces. The monastery’s main church was destroyed by fire in around 1930. The survival of the Garima Gospels may have been due to the fact that they were hidden, perhaps for centuries or even for more than a millennium. The hiding spot may have been forgotten, and it could have been rediscovered by chance in relatively modern times. In 1520, Portuguese chaplain Francisco Álvarez visited the monastery and recorded that there was a cave (now lost or destroyed), where Abba Garima was reputed to have lived. Álvarez reported that the monks would descend into it by ladder to do penance. Although speculation, it is possible that the Gospels may have been hidden in this cave. What will become of the Garima Gospels now? Ethiopia’s Holy Synod and scholars feel that an appreciation of their importance will mean they will be protected more carefully. For the monks, the Gospels are primarily regarded as holy relics, linked directly with Abba Garima, who is a saint. A museum is now being set up to provide a secure place where the Gospels can be seen by visitors. On the edge of the monastery is a 19th-century church for female worshippers, but this has just been replaced by a modern building. Work is therefore underway to convert the old church into a museum. Its windows are small, which is good both for security and to keep light levels down, and steel bars are being inserted. The building will also be protected by armed guards.